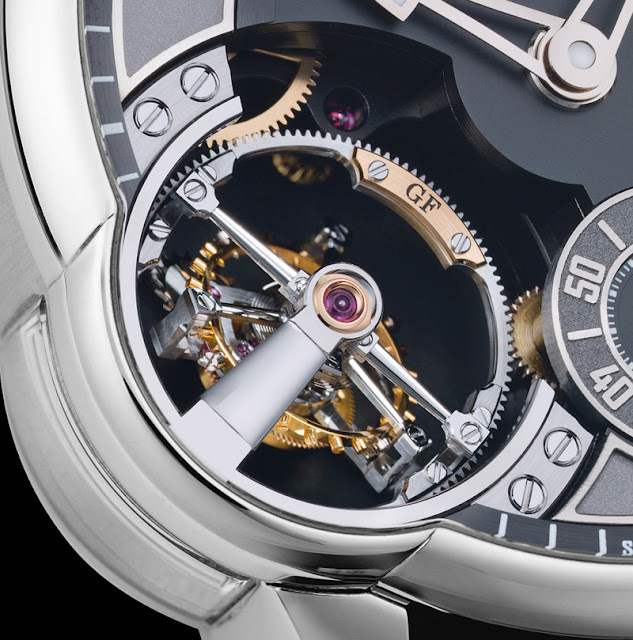 Greubel Forsey recently presented the Double Tourbillon Asymétrique, a reinterpretation of Robert Greubel and Stephen Forsey’s first invention, the Double Tourbillon 30°, in a new asymmetric case. To achieve this, the movement architecture had to be reconstructed, with the outer cage of the patented double tourbillon inversed. The manual-winding movement - which provides a 72-hour power reserve thanks to the two mainspring barrels in series - is housed in a 43.5 mm diameter case with a curved lateral window in the case band at 8 o’clock. Height of the case is 16.13 mm. 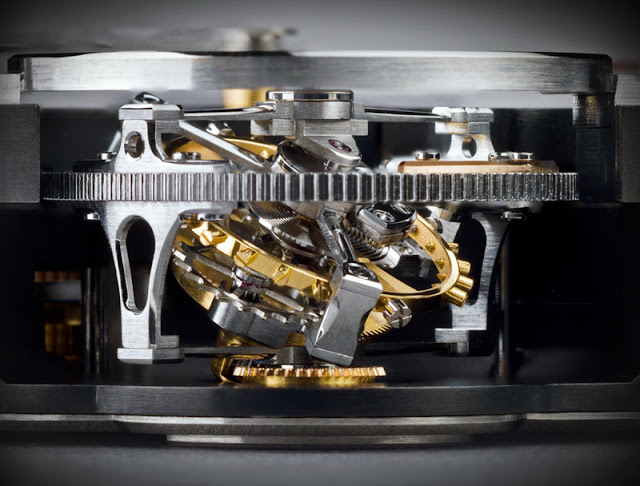 The black treatment of the mainplates, forming the backdrop for the tourbillon system emphasises the three‐dimensionality and depth of the double cages. The inner and outer cages of the tourbillon make one revolution in 1 minute and 4 minutes respectively. The inner cage is at a 30° angle to the outer cage. The power reserve indicator at 2 o’clock features an innovative rotating disk displaying optimal remaining running time by means of a fixed red triangle instead of a conventional hand. The minute ring is concentric around the satin-finished hour display, with the applied polished gold hour indexes creating additional contrast and relief. 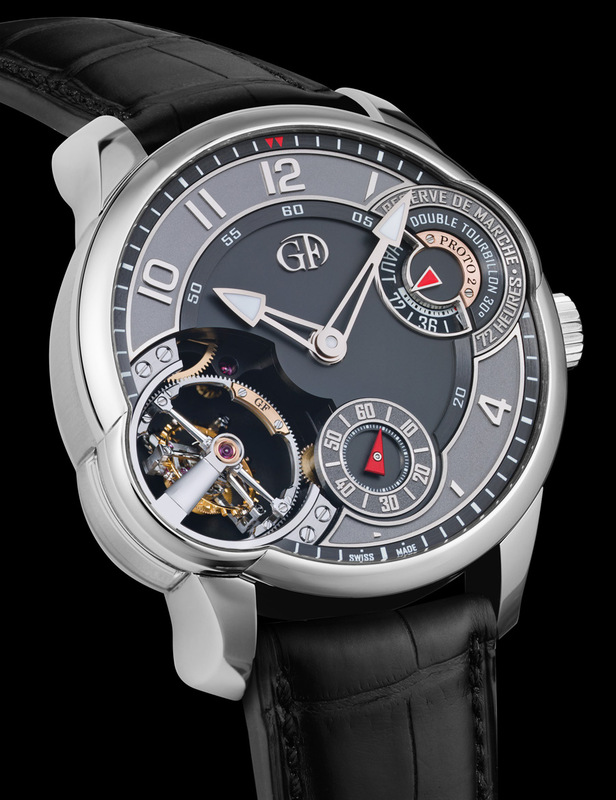 In the white gold version, the dial is finished in shades of grey, anthracite and black, while the dial of the red gold version is treated in black and anthracite. 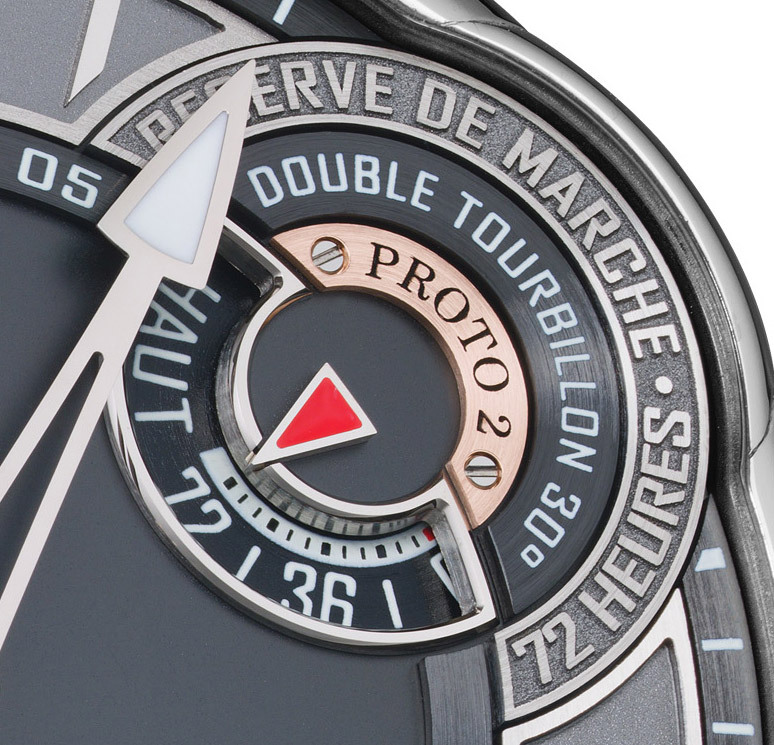 The small seconds at 6 o’clock features a striking triangular red hand, one of three bright red details on the dial. The sapphire crystal case back displays the nickel-palladium treated frosted and bevelled gear-train bridge whose internal angles are meticulously polished. 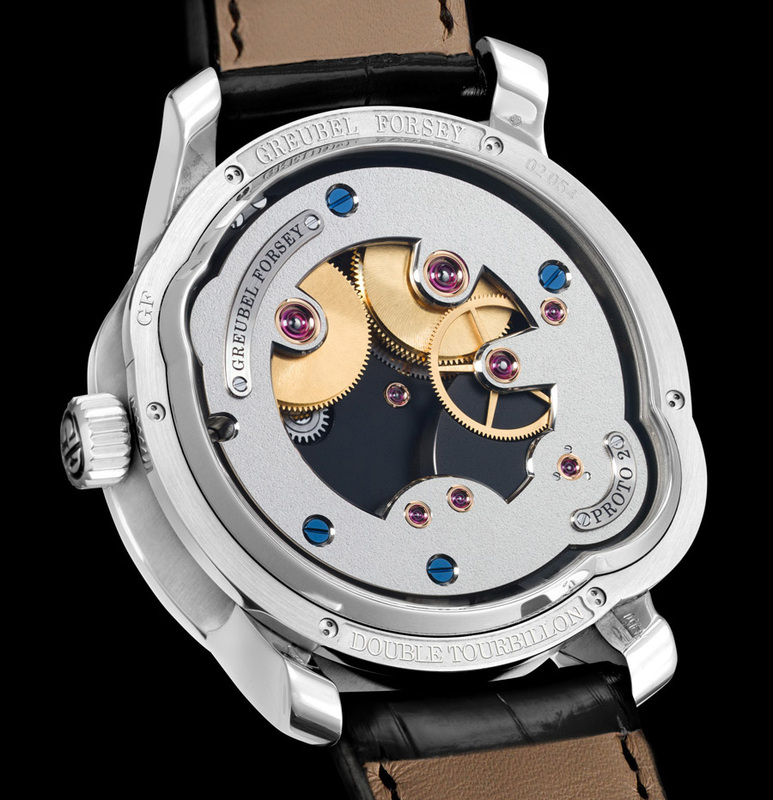 This bridge, fixed by four blued-steel screws, supports two white gold plates: one with the individual number of the timepiece mirroring that on the power reserve indicator; the other signed ‘Greubel Forsey’. The Double Tourbillon Asymétrique is available in a unique edition comprising 11 pieces in white gold and 11 pieces in red gold.